Art: Make friendship bracelets to give away. Storytelling: Hear a short melodrama with simple audience participation. Sports: Shoot REAL bows outside on the lawn. Younger students can memorize the section outside the parentheses. Older students should memorize the entire verse. Children practice loving each other by making a friendship bracelet to give away to a friend. Children know that David and Jonathan loved each other. Children know that Jonathan expressed his love for David by giving him gifts. Thread: Embroidery floss is the most common type of thread used for making friendship bracelets. Other thread such as hemp or yarn could be used. Binder clips (one per child) for holding thread in place. Clipboards could be used instead of binder clips. Fabric glue for an added touch of security for the loose ends. Scissors. These need to be fairly sharp to cut the embroidery thread. Binder clips (one per child) for holding yarn in place. Clipboards could be used instead of binder clips. Cereal with holes such as Cheerios, Fruit Loops, etc. Table and chairs. No special decoration needed. After David killed Goliath, he was brought to King Saul. Saul was happy that David had defeated the Israelites’ enemy. From that day on, Saul had David live with him in the palace, and did not let him return to his father's house. Saul’s son, Jonathan became very best friends with David. The Bible says he loved David like he loved himself. They were like brothers. Jonathan made a covenant with David because he loved him so much. Jonathan wanted to be best friends with David for his whole life, so Jonathan took off the robe he was wearing and gave it to David, along with his tunic, and even his sword, his bow and his belt. David became a great warrior. But as he grew more and more respected and loved by the people, Jonathan’s father, King Saul began to hate David. Saul determined to kill David and secure the throne for Jonathan. Several times Saul tried to kill David, but Jonathan talked him out of it. For a while there was peace, but Saul’s anger and jealousy flared again, and he determined again to kill David. This time Jonathan could not talk his father out of wanting to harm David. Jonathan knew that his father intended to kill David. The Bible says Jonathan got up from the table in fierce anger; on that second day of the month he did not eat, because he was so upset at his father's treatment of David. He took his bow and arrow and warned David. When it became clear that David had to go into hiding and that they might never see each other again, Jonathan said, "Go in peace! We have vowed friendship in GOD's name, saying, 'GOD will be the bond between us, and between my children and your children forever!'" David and Jonathan could have been enemies and rivals, yet they set aside jealousy, resentment, bitterness and competition, choosing instead to become the closest of friends. They were real men, able to show the love of a brotherly friendship, willing to lay down their lives for one another. We learn a great lesson in friendship from the story of David and Jonathan. They were loyal friends throughout their lives. Are you a true friend? Do you take up for your friend if someone starts saying bad things about him or her? Do you come to their defense? What are some special things you have done for a friend? Have you ever given a friend a gift? Today we are going to make a gift you can give to a friend. 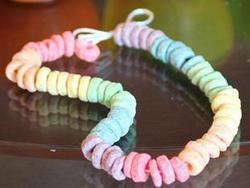 Note: Preschoolers will be making necklaces. We are making friendship bracelets. Pass out gold thread. Remember, Jonathan said, “'GOD will be the bond between us.” So we will use gold thread to remind us of God. Pass out purple thread. Jonathan was a prince. He was royalty. So we will use purple thread to remind us of Jonathan. Pass out gold thread. 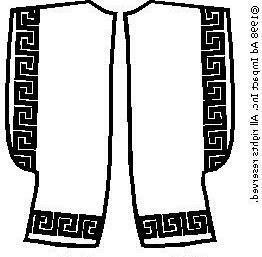 David was a shepherd, so we will use white thread to remind us of David. See instructions below for making bracelets and necklaces. Use the striped friendship bracelet instructions. a twist or braid is easiest. Use a thick yarn as the stands will be easier to control. End with a prayer and have the children assist with the cleanup. Children will watch a short drama (acted out by adults) with simple audience participation. Moderator Notes: With older children you could make copies of the script and have them act it out having the congregation do the audience participation. It would make a good presentation in front of the congregation the last Sunday of your rotation. Read the scripture and storytelling/drama script ahead of time. Talk about what it means to be a friend. Ask who their best friends are. Discuss how we treat friends. How do we show love for our friends? How does God show his love for us? Can Jesus be our friend? Today we have been talking about friends. In the Bible we can read about two very best friends. I think I see one of them now! [David comes on stage.] David was a wonderful hero. People threw parades for him and cheered for him, so we are going to say “hip-hip-hooray!” when we see David, OK? Let’s practice. Hip-hip-hooray! This is David’s very best friend, Jonathan. He is really good with a bow and arrow, so when we see him we’ll say z-z-zing to sound like an arrow. Do the motions, too. Let’s practice that one now. (When they have it down, King Saul comes on stage.) This is Jonathan’s dad, King Saul. He started out a really good guy, but became a bad guy, so we’ll say boo-oo when we see him, ok? Great! Can you remember what we say when we see each of them? I have some signs to help you. (Hold up signs and let them practice. (Practice until they do all three correctly. Then all three leave the stage.) See you guys later! (To audience,) Who wants to hear the story of David, Jonathan and King Saul? Review how the melodrama script is different from the real Bible story. 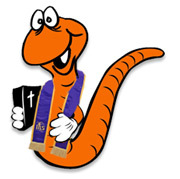 Make sure the kids know that Bible story is true. Journal: Have children draw their best friend and write something kind they could say about that person. Be sensitive to children who may feel they have no friends. Help the children make new friends so that everyone in the class has a friend. Narrator: David and Jonathon hung out all the time and did everything together. [David and Jonathan act out what the narrator says.] They played video games together, played football together, and even took kung foo classes together! They were the best of friends! There was only one problem in David’s life and it was a BIG one. Narrator: Jonathon’s father, King Saul, became jealous of David and hated him because he did not want David to become the next king of Israel. Saul had done some very bad things and knew that the people liked David more than they did him and that made him angry. Jonathan: Surely this can’t be true! David: I know this to be true, and don’t call me surely! David: Tomorrow is a big party and I am expected to be at the palace, but I’m going to go hide and when Saul asks where I am, you should tell him I went to my family’s house for a party there and you said it would be fine. Then, if he gets angry, we’ll know he wants to kill me. Narrator: This sounded like a pretty good plan to both of them, so they sealed it with their secret handshake and then went their separate ways so Jonathon could get ready for the big party. King Saul: Where is the son of Jesse? Jonathan: Would you permit me to go down there and hang out with him? Jonathan: Those arrows are beyond you. Why don’t you just go back home? Narrator: So, Jonathon’s servant went back home and David came out to say goodbye to Jonathon because now he had to go into some serious hiding. Narrator: He thanked Jonathon for all his help and then they did the secret handshake and left. Eventually David became king, not Jonathan. They loved each other for their whole lives. As they hear the story friendship is demonstrated using a number of experiments. Toilet tissue, one square per child, cut into fourths. I made sticker pages from paper dolls at www.makingfriends.com. I used the Bible Friends pages. I made two friends, dressed them in Bible-times-looking undergarments, and copied them onto a page together. I copied clothes onto sticker paper for David and Jonathan. (I made a bow and arrow to go with the clothes.) I pre-cut the sticker pieces and placed in baggies for the children. Email me for more information. Divide children into two groups. If you have a multi-age class, be sure older children are at both tables. Have kids sit at tables and turn so they can see you. Right after David killed Goliath he was brought to King Saul. Saul was pretty happy with David because he had defeated a giant that no one else in his whole army would face. Saul invited David to live at the palace with him. David also married Saul’s daughter. He became like part of the family. Saul’s son, Jonathan became VERY BEST friends with David. In fact, they even made a covenant with each other, promising to be friends forever. A covenant is like a contract. It is a solemn promise to do something. Sometimes we say, “I promise” and we don’t really mean it, but it was a very serious thing for David and Jonathan. They promised to be friends and love each other for their whole life. Jonathan took off the robe he was wearing and gave it to David, along with his tunic, and even his sword, his bow and his belt. That is how close they were. A covenant is like the stickers: it can’t really be undone. The clothes stick on the picture because of the sticky stuff called adhesive. We call this Cohesion. Cohesion results from the attraction that atoms and molecules have for one another. It is the force that holds material together. Cohesion also occurs on common everyday objects without glue and all kinds of everyday situations - rain sticks to a car's windows, dust to the ceiling fan, chewing gum on Mom's carpet. And it’s a good way to describe David and Jonathan’s friendship – they were stuck together. They were both great military men. But David became such a great military leader that people sang songs about him. They sang: "Saul has slain his thousands, and David his tens of thousands." Saul was very jealous when he heard this song. You see, he was all about getting the glory for himself. He also knew this was not good news for his son, Jonathan. Saul wanted Jonathan to be king after he died, not David. Instead of seeing and doing God’s will, Saul tried to have David killed, but Jonathan intervened. Jonathan spoke to his father about David and reminded him that David had not done anything wrong, and that what David had done had benefited both Saul AND the kingdom. Saul listened and promised not to kill David. Jonathan thought everything was over, but as soon as Saul sent David out to war again, he was jealous all over again. Over and over Saul and David had conflict because of Saul’s jealousy. Finally, David went to Jonathan and asked, "What have I done? What is my crime? How have I wronged your father, that he is trying to take my life?" "Never!" Jonathan replied. "My father doesn't do anything without confiding in me. It's not so!" But David said, "Your father knows we are best friends. He will not tell you. But Jonathan said to David, "Whatever you want me to do, I'll do for you." So they came up with a plan to figure out what Saul was up to. David was right. Saul wasn’t telling Jonathan his plans because Saul knew they were too close. Saul also knew he wasn’t going to break their bond of friendship because it was backed by God. Start with a clean, dry penny. Traces of moisture may cohesively attract the dome to spill over the edge too soon. 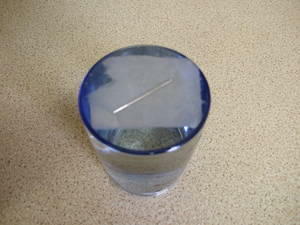 A bottle cap raises the penny above water that spills during repeated trials. Students will naturally compete to see who can heap the most water on their pennies. Drops should free fall onto the dome for counting accuracy. A penny typically holds 20 drops of water (1 mL) or more before spilling over the side. If the competition takes too much time, just have the children put 18-20 drops on their penny. (Pass out bowls, bottle caps, pennies and water droppers.) Let’s see who how many drops of water your penny will hold. Turn your bowl upside down. Set your dry penny on a dry bottle cap on top of the upside down bowl. 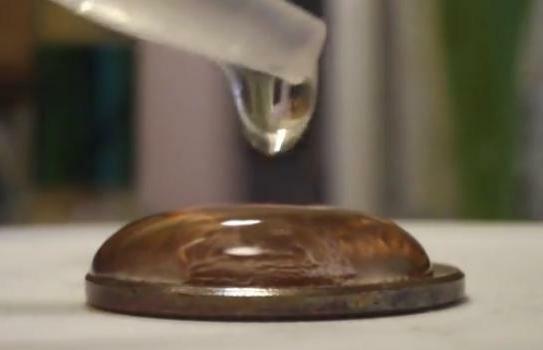 Very carefully drop one droplet at a time onto your penny. Count each one. How many drops will the penny hold? Saul could not break the bond of friendship just like the pin did not break the water dome. That just showed how close David and Jonathan were. Jonathan didn’t care if it meant he would not be king, he still loved David and wanted what was best for him. And David loved Jonathan, too. Jonathan found out that his dad was again trying to kill David. If the tissue doesn’t fall away, gently push down on the corners with a pencil. He warned David with his bow and arrow. So let’s have our needles be our arrows and see if we can get them to float. Cut the string until just a little bit is left, to be the feathers on the arrow. When Jonathan warned David, he shot the arrow past where he sent his servant. Gently lift one side of your bowl and let your needle float from side to side. David and Jonathan were heartbroken that Saul wanted to kill David. Jonathan knew this was very sad news. The Bible says they cried because they were so sad. Add some salt to your water and make it like tears. Does it make a difference? Now sprinkle some pepper on top of the water. When David went away, many men went with him. They followed David because he was a great military leader. Let’s pretend the pepper is David and his men. Now, take your dropper and get a little dishwashing soap. (wait) Drop several drops of dishwashing detergent in the center of the water. What happens to the pepper? David ran away and hid from Saul. He knew this meant he had to give up his friendship with Jonathan and that made him very sad. When you drop the detergent into the water, it reduces the cohesiveness between the water and the pepper. And the pepper ran away, just like David. Do you have a friend who is like Jonathan to you? Is there someone in your life who isn’t very nice like King Saul? How does your friendship help you deal with the mean person? Note: This is potentially a long lesson. Skip the salt or other areas if you need. Make sure you have time to discuss the questions at the end. Be sensitive when asking the questions at the end. Be prepared: children sometimes deal with bullies and real abusive situations. For preschoolers: They can do the stickers. The teacher could do the experiments for the group while the preschoolers help or do their own. For example preschoolers can use the water droppers, but may not be exact enough to make it work, so have one that is done according to the directions for them to look at. Children will be like Jonathan and shoot a real bow. Children will remember that friends help each other. This workshop is outside. The children’s safety is of upmost importance. Set up the shooting area in such a way that the children can easily be kept safe and the arrows can easily be found. There should be plenty of room behind the ‘rock’ for the arrows to fly without possibility of hurting anyone. After David killed Goliath he was brought to King Saul. (David was still holding the Philistine's head.) Saul invited David to live at the palace with him. Saul’s son, Jonathan “became one in spirit with David, and he loved him as himself”. That means they were VERY BEST friends. In fact, they even made a covenant, or an agreement with each other. Jonathan took off the robe he was wearing and gave it to David, along with his tunic, and even his sword, his bow and his belt. That is how close they were. Saul was very jealous when he heard this song. "They have credited David with tens of thousands," he thought, "but me with only thousands. What more can he get but the kingdom?" Saul told his son Jonathan and some other people to kill David. But Jonathan was David’s friend, and warned him. Then Jonathan spoke to Saul about David and reminded him that David had not done anything wrong, and that what David had done had benefited Saul and the kingdom. Saul listened to Jonathan and took this oath: "As surely as the LORD lives, David will not be put to death." So Jonathan called David and told him the whole conversation and David and Saul were friends again. Saul again sent David out to war. David did great, but that just made Saul even more jealous. Over and over Saul and David had conflict because of Saul’s jealousy. Saul would threaten to kill him and David would run away. Finally, David went to Jonathan and asked, "What have I done? What is my crime? How have I wronged your father, that he is trying to take my life?" "Never!" Jonathan replied. "You are not going to die! Look, my father doesn't do anything, without confiding in me. It's not so!" But David said, "Your father knows we are best friends. He will not tell you. But as surely as the LORD lives and as you live, there is only a step between me and death." So David hid in the field and Jonathan went home. When the New Moon festival came, the king sat down to eat. He sat in his customary place by the wall, opposite Jonathan, but David's place was empty. The next day, David's place was empty again. Then Saul said to his son Jonathan, "Why hasn't David come to the meal, either yesterday or today?" Jonathan answered, "David asked me for permission to go to Bethlehem. That is why he has not come to the king's table." Saul's anger flared up at Jonathan and he said to him, "Don't I know that you have sided with David! Shame on you! As long as David lives on this earth, neither you nor your kingdom will be established. Now send and bring him to me, for he must die!" Then Jonathan knew that his father intended to kill David. Jonathan got up from the table in fierce anger; and he did not eat, because he was grieved at his father's shameful treatment of David. In the morning Jonathan went out to the field for his meeting with David. He had a small boy with him, and he said to the boy, "Run and find the arrows I shoot." As the boy ran, Jonathan called out after him, "Isn't the arrow beyond you?" Then he shouted, "Hurry! Go quickly! Don't stop!" The boy picked up the arrow and returned to his master. Then Jonathan gave his weapons to the boy and said, "Go, carry them back to town." After the boy had gone, David got up from beside of the stone and bowed down before Jonathan. Then they kissed each other and wept together—but David wept the most. Jonathan said to David, "Go in peace, for we have sworn friendship with each other in the name of the LORD forever.” Then David left, and Jonathan went back to the town. (Discuss the story, especially the part when Jonathan shoots the arrows and that message to David. You may use questions like these. Why did David fear Saul? Why did Saul want to kill David? How did Jonathan find out Saul wanted to kill David? How did Jonathan warn David? Now, who wants to shoot a bow and warn David? For this we want the children to reenact the part of the story where Jonathan shoots the arrow and warns David. We were hoping a Boy Scout pack would lead it for us, but they may just 'consult' with us on safety and instructions on proper techniques. The details are a little sketchy because I don't know exactly what procedures we need to do. A lesson written by Staci Woodruff from: Jenks Church.